Pulsar introduced two new digital night vision attachments that attach to your optical daylight rifle scope. The new series is called Forward F and is placed in front of your optical scope. The series currently consists of two different models. First, there’s the Pulsar F135 and then the F155. They attach to a mounted daytime scope and convert it into a digital night vision scope. The NV attachments mount easily and it only takes a few seconds based on Pulsar’s description. Both models are overall very similar in their specifications and the most significant difference is the detection range. The F135 has a maximum range of 370 meters while the F155 extends that range to 450 meters. The sights are equipped with a CMOS sensor that has a 702x526 camera resolution which then is made visible on a AMOLED display with a reasonably high resolution of 640 x 480 pixels. The resolution is a good match for the operational detection range of up to 450 meters. It makes the setup a great choice for predator and hog hunting. The F series has built in Wifi which allows you to stream your visuals live via YouTube or the Stream Vision App by Pulsar. You can instantly share your imagery with friends or with your hunting buddy. All digital night vision scopes and attachments require a light source to send out light that then gets reflected. 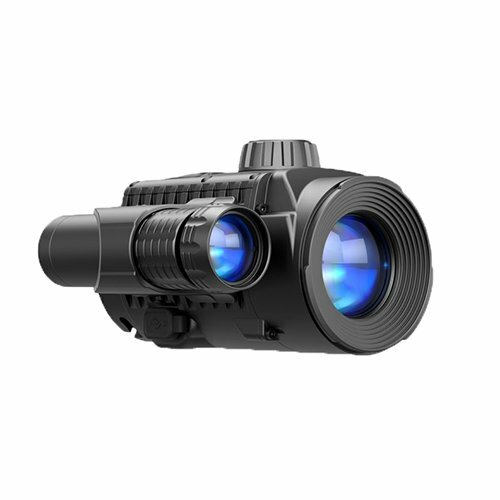 The Pulsar F series uses a 940nm LED IR illuminator. The infrared light is sent and reflected to produce the visual you can see on the screen. The IR illuminator can be adjusted with three different power modes. It can also be set to cast a wide view or to focus on a spot within the field of view for precision targeting. The night vision attachments can quickly be installed or removed to allow you to use your existing day-time optics and transform them during the nighttime into a sophisticated NV setup. The sights are designed to be capable of handling high-powered firearm recoil up to .375-cal! In addition the devices are waterproof to allow you to confidently use them in the field during your night hunts. The light source and the screen together with the electronics require electrical power. In the case of the Pulsar F 135 and F 155 you will have a rechargeable battery pack that lasts up to 9 hours. The NV attachments further come with a lens cover and cloth, a MicroUSB cable and a carrying cable.